Glasgow’s a hub of activity and with so much to see and do, it wouldn’t be possible to do it all in two days! With this in mind, we appreciate that our guests often have limited free time out from their busy lives to delight in our city, so we would like to give you a taste of what’s on offer if you only have 48 hours with us. 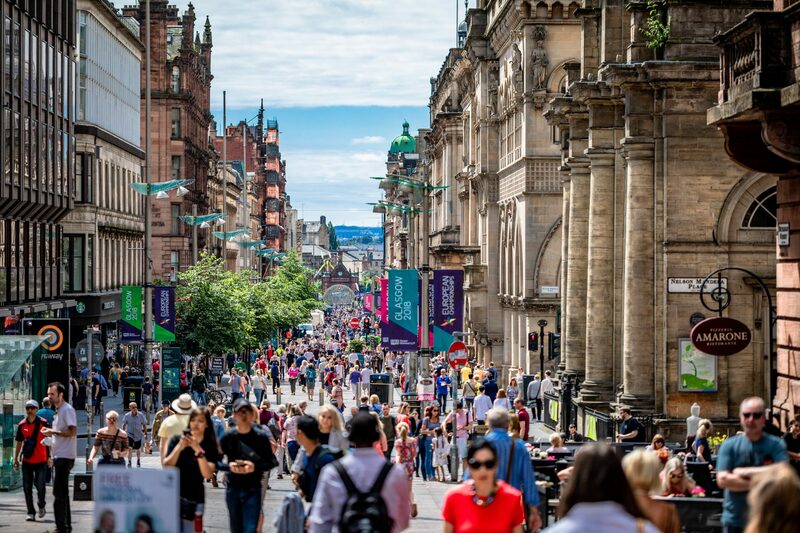 The majority of our guests arrive in the city centre, either by train or from the airport, so allow yourself a few minutes to experience the unique ambience of Buchanan Street, one of the UK’s longest shopping streets and also known as the style mile. If you’re feeling famished, get into the British spirit with a fish supper at Chippy Doon the Lane – a chic little eatery just off the main street. Now it’s time to unload the bags and make yourself at home. The Acorn Hotel can be accessed easily by bus or taxi, and is less than one mile from the city centre – if you’re feeling energetic, you could even arrive on foot! Our welcoming and experienced staff make the check-in process easy and are happy to make recommendations and to give advice, please just ask. One of the most informative ways to check out the city is by hopping aboard a sightseeing tour bus. You will find them regularly departing from various points throughout the city. You’ll see all the famous landmarks, the Cathedral, West End and River Clyde region. You’ll also hear an engaging commentary on board, presenting you with an understanding of our history and culture throughout the tour. Don’t forget that discount vouchers can often be obtained by reception staff at the Acorn Hotel, so remember to collect these before you buy. top-notch seafood dishes, Rogano bar staff certainly know how to create a fantastic cocktail. To top the night off, wander a few steps to the glamorous One Up for more cocktails and some dancing. With club favourites blasting out all night long and a cooling roof terrace, you couldn’t ask for more to round off your Saturday! luxurious treatments on offer – we’ve got our eye on the Top to Toe Experience! Well, we think that’s ample to be getting on with for just 48 hours in one of the UK’s most vibrant cities, but if you have more inspiration, just give us a heads-up – we’re brimming with local knowledge and love to pass it on!